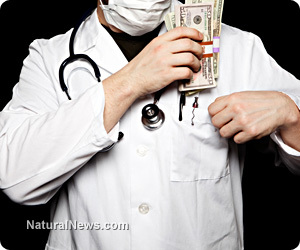 (NaturalNews) As we have often reported, most traditional cancer treatments are fraught with unnecessary health risk and are part of what we have described as a "criminal cancer industry" that exploits the bodies of women and men solely for profit. And little by little, modern cancer treatment regimens are being exposed for what they are - part of a scam that funnels money to an industry that neither seeks a cure nor spends much time discussing cancer prevention, because prevention would deprive the industry of the profits of "treatment." The latest evidence of this comes from a study of older men who scientists said died from causes other than prostate cancer, even though almost half of them were found to have had prostate tumors. And, added Reuters, "up to half of those tumors detected on autopsy would have qualified for treatment had doctors known about them while the men lived, though none had been the cause of death." What does that mean? The study's authors said they believe criteria for treating prostate tumors "might be worth reexamining," a conclusion which supports a growing school of thought that it might be better to wait and see if prostate conditions worsen before jumping right into treatment - which includes invasive surgery, poisonous chemotherapy and body-ravaging radiation therapy. "The study suggests that the progression of early prostate cancer, including some more aggressive forms of the disease, is far from inevitable within a man's lifetime as many such tumors are found in men who died from other causes when their prostate is analyzed on autopsy," lead author Dr. Alexandre Zlotta, who is the director of Uro-oncology at Mount Sinai Hospital in New York, said. "The study concludes that it is probably worth re-examining our current definitions of clinically unimportant and clinically significant prostate cancer," Zlotta told Reuters Health in an email. The scientist said he and his colleagues took a look at the prostate glands of more than 300 men who were past the age of 60 and who had died from a variety of causes - excluding prostate cancer. Zlotta's team conducted autopsies on 220 in Russia and 100 in Japan, both countries where prostate-specific antigen (PSA) screenings are not performed with as much regularity as in the U.S.
"Zlotta and his colleagues selected a Caucasian population of Russian men similar in lifestyle and risk factors for prostate cancer to U.S. men in order to look at how common the cancer is in older men who have not been routinely screened," Reuters reported. "In the U.S., the number of tumors they found would have been much lower because many would have been identified by screening and treated or removed before death, Zlotta pointed out." For a comparison, he said his team "chose an Asian population in Japan because clinically detected prostate cancer and mortality are much lower among Asian men compared with Caucasian men and their lifestyles/diet are dramatically different." Many fewer Japanese men are diagnosed with, or die from, prostate cancer than do U.S. men. But the study nonetheless found that the disease is prevalent in the same proportion of men - and that serious tumors are even more common - in Japan, according to prostate exams conducted on men who have died. According to results of the study, which were published in the Journal of the National Cancer Institute, nearly 40 percent of Russian men were found to have tumors of the prostate, compared with just 35 percent of Japanese men. One-in-four tumors in Russian men were considered serious enough to have required surgery or radiation in the U.S.; that compares with one-in-two tumors in Japanese men. But despite growing evidence that postponing or, better yet eliminating, dangerous prostate treatment, there are still too many "establishment" medical types who want you to believe that cutting, burning or poisoning a man's body is a better course of action. "We should be cautious about trying to apply the results to Americans where we have a very heterogeneous population including very high risk groups such as African Americans," Dr. Stacy Loeb, a urologist at NYU Langone Medical Center in New York, told Reuters. Loeb does, however, at least acknowledge that prostate screening can also detect smaller cancers, and that aggressive treatment of those can lead to "unnecessary side effects," Reuters said. Then again, the screening process itself is dangerous. Read staff writer Ethan Hunt's piece on that here: http://www.naturalnews.com.